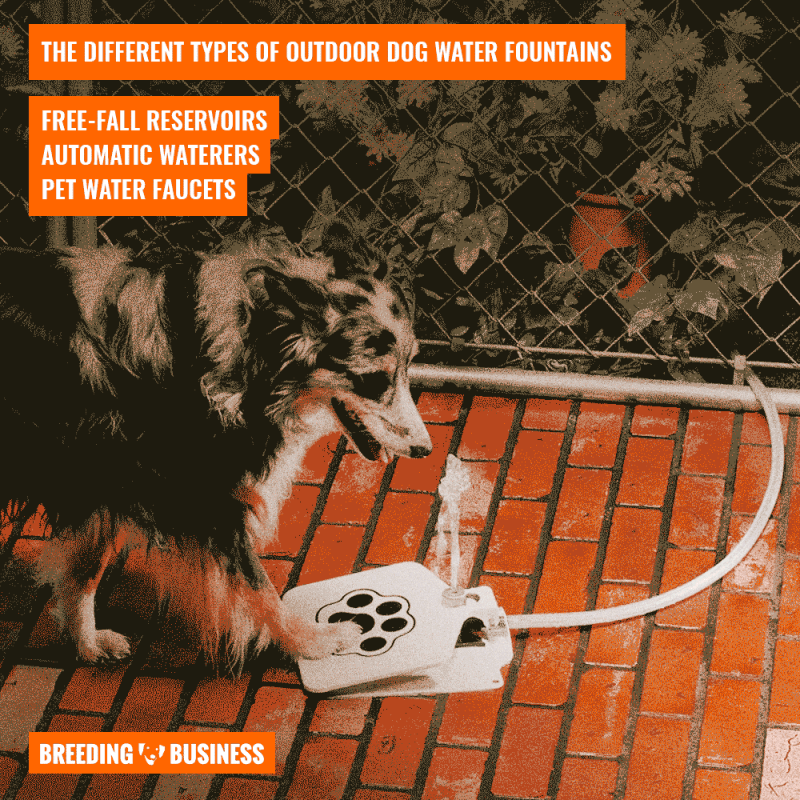 Top 7 Best Outdoor Dog Water Fountains — 2019 Reviews! Outdoor dog water fountains provide a cleaner, fresher, and more enticing water experience compared to the usual water bowls. The main reason for choosing outdoor pet water fountains is mainly for the sole purpose of avoiding water that has been left out stagnating for a period of time. A relatively steady stream of clean and fresh water provides just the right ambiance for a dog’s instinctive tastes. Stagnant water is often reminiscent of dirty ponds in which, even with a clean bowl available, is a breeding ground for bacterial growth over time. As previously mentioned, outdoor dog water fountains are a safer bet for your dog due to its ability to keep water fresh and clean for longer periods of time. Additionally, using an outdoor fountain will dramatically reduce human interventions for cleaning purposes. A normal water drinking bowl will inevitably require regular sanitizing to get rid of dirt, bacteria, and potential germs. Thanks to the circulation of the constant flow of clean water, outdoor dog fountains stay cleaner for a lot longer without the need for you to intervene. Furthermore, a water bowl will have to be repeatedly filled up every few hours in order to ensure freshness. On the other hand, water fountains come equipped with a reservoir which, in turn, contains a much bigger volume of water than a regular drinking bowl. Some outdoor water fountains for pets can even be connected to a water pipe. Generally, there are currently two main types of outdoor dog water fountains currently available on the market. The reservoir water fountain is the standard use for dog owners and is often the most used and most common fountain for dogs. The reservoir dog water fountains simply allow you to pour a decent amount of water anywhere from half a liter up to several liters of clean, cold water. Keep in mind the climate and time of year these reservoirs are being utilized. Typically, during the warmer months, the water will run out rather quickly. Furthermore, if you have several dogs, this will also cause the water to run out thus, needing another fill-up. However, there are several new automatic dog water fountains coming out on the market now that do not feature the reservoir. In contrast, these are automatically refilled. 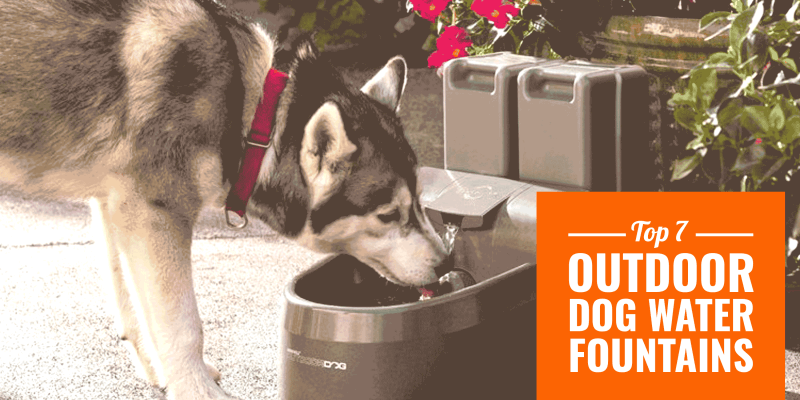 Generally, the automatic outdoor dog drinking fountains are designed to be connected to a water pipe, or also a tap such as a dog water faucets. In this case, these fountains automatically refill themselves on a consistent basis using the natural flow of a water base. These water fountains make an ideal commodity for an outdoor setup with many dogs or big drinkers. Pick the right type of water fountain for you: reservoir, tap, or auto-refill? Outdoor dog drinking fountains are invaluable for hydrating and freshening up your dog, especially during the summer season. For dogs living outdoors, such fountains provide an ideal environment with convenience in mind. Additionally, most outdoor dog fountains come embedded with a water filtering system that is often changeable. This is great for keeping the water clean at all times. 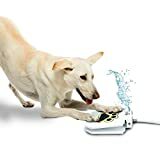 As opposed to conventional water bowls, you don’t have to worry about the water collecting bugs and residual chemicals over time with automatic pet waterers. Convenience comes with a price so it’s up to you what trade-offs are you willing the deal with. This dog water fountain, built and designed by PetSafe, offers a complete 360-degree drinking experience for dogs. Perfect for those households that hold several dogs, now all dogs can replenish themselves simultaneously. The PetSafe Drinkwell 360 has a 128-ounce water capacity catering to pets of any size. 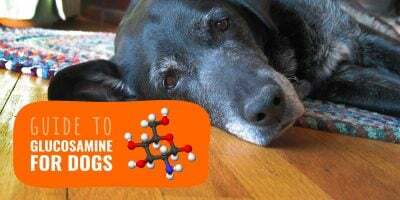 With up to 5 free falling of clean, fresh water and a replaceable carbon filter, dogs stay hydrated for longer periods of time. This product is made of BPA-free plastic which makes it super easy to clean and is washable in the dishwasher. The adjustable flow of the PetSafe Drinkwell 360 allows users to customize the stream flow from the controlled cap. One of its major features is the large reservoir this drinking fountain provides. The foam filter catches hair and debris and is replaceable while the pump provides a silent rotation that won’t disturb your pet. 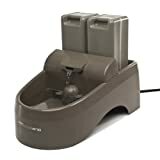 Based and manufactured in the US, the PetSafe fountain has been one of the main industry leaders on the market for pet products ever since 1991. From Monday through Saturday, buyers can call the US-based support number for any issues and inquiries. Users appreciate how easy it is to clean the fountain while others ensure that filters do not need to be utilized in order to operate the product. Even cats love it! 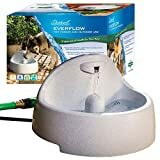 With this indoor and outdoor dog water fountain, PetSafe has uniquely manufactured another watering hole for freshwater drinking that your pets can enjoy. With a water capacity of 450oz and its usage designed for any type of dog of any size, this well encourages deep hydration. The drink well features a free-falling stream of clean water that encourages your pets to continually drink. This relatively outdoor design gives it resistance to UV rays as it helps to prevent fading during outdoor use. It’s also thoroughly convenient for indoors as well. Like its other counterpart fountain, it’s easy to clean and provides BPA-free plastic. The carbon water filter is replaceable and assists in keeping out bad odors as well as tastes. 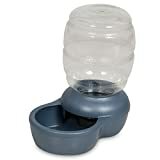 This PetSafe dog water fountain features higher bowl edges to prevent easy spillage during drink time. It also features two filtering methods which include a larger foam filter that catches the bigger particles to prevent clogging, as well as a layered charcoal filter that acts to remove the smaller particles. The dual reservoirs of this fountain keep the water supply sufficient. Users rave how this product is useful for bigger dog breeds, although some buyers complained of the noise it makes. This professional grade automatic waterer is long lasting considering this water bowl is an auto-fill bowl. The automatic feature in the Easy-Clean works by hooking up the hose to a water pipeline source. This bowl is designed and suitable for dogs of any breed and size and even for livestock and horses. No longer do you need to fill up and take out dirty water of your pet’s water bowls, just simply hook it up and let the bowl work for you. The float valve which sits in the bowl helps to maintain the steady flow and keep the bowl filled with water at a consistent level which works for larger dogs as well as multiples. It’s quiet so you don’t have to worry about noisy filters. It also prevents spraying. This bowl is very compact which makes it easier to handle and clean. You can order it with either a 5 ft tube, 10 ft, or 25 ft poly tube. Another great benefit is it can be used for both outdoor and indoor use. 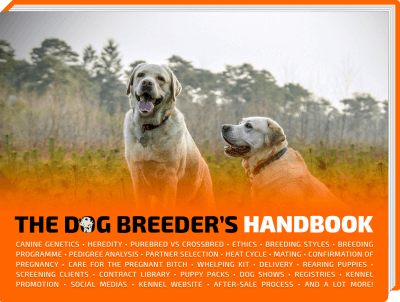 One user praised this product claiming it kept her Great Dane breed out of the watering bucket. Others love how versatile it is for various forms of animals. Although, a few users have complained that the quality is not up to par in comparison with other similar products or complained of some leaking issues. 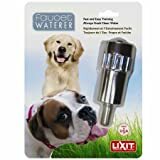 The TrioGato Water Sprinkler is a great step-on dog waterer and is no doubt one of the most fun and useful dog water fountains on the market. This waterer allows your dog to simply step on the device to automatically get fresh and clean water from the tap. It’s a wonderful way to stimulate and hydrate your dog at the same time. Designed and manufactured with heavy gauge steel, it’s proven to be strong and durable. The additional copper valve is leak proof and the friction pads made of rubber allow for smoother friction. The set-up process for the TrioGato Dog Water Sprinkler is convenient and manageable for any user. It comes with the appropriate set of connectors and adapters for the right fit. In addition, a 2-way hose splitter is provided for easy water source connection and controlling the water pressure can be done on the control valve which is located on the splitter. With a 40.5-inch hose length and 2.4-inch device height, Boxer breeds approve of it and it doesn’t take long for dogs to catch on to the workings of the device. Because of its unique concept that adds pleasurable joy to any dog, buyers rave how brilliantly fun and useful it is. Especially for such an attractive price. PetSafe is a very active and popular brand on the pet market today. This automatic model contains an automatic feature assembly and can hold up to 192 oz of fresh, clean water. 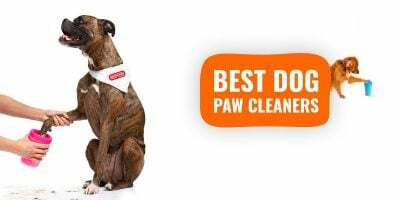 This means it works well for any brand or size of dog or for multiple dogs. It features a continuous flow of free-falling water that encourages pets to drink more. Used outdoors, when connected to a water base such as a garden hose, it automatically refills. Extremely easy to clean, this fountain is dishwasher safe. The slick design resembles their usual water bowl with raised edges to prevent spillage. Users can adjust the flow with the convenient handling of the float valve. The chances of a bacteria overgrowth are greatly reduced due to the constant refill of fresh water along with the help of the replaceable carbon filter. These filters, made of coconuts, work through a carbonization process which enables the absorption of harmful chemicals or debris. Buyers enjoy this fountain for the aeration claiming that both cats and dogs love to use it. However, one user advises it works great if the quick release feature is not utilized. PetMate tends to engineer superb products with various ranges of design. With the Replendish Gravity Waterer, this fountain has produced an elaborate and unique gravity water dispenser for dogs to enjoy their fresh water daily. It is simple to assemble and cheap to purchase. This is a very economical choice for interested buyers. This water dispenser is not automatic. Containing a huge reservoir for clean water, the Gravity Waterer is great when staying away from home and is convenient for travel due to its compact size. Users don’t have to worry about constantly filling up their pet’s bowl with this device. Designed with an enhanced water filtration system, it works to remove dirt, debris, and harmful chemicals that may be found in water when exposed to air. In addition, the Microban Antimicrobial Protection feature works to prevent further damage by eliminating bacteria that cause odors and stains. Buyers appreciate the resourcefulness of the gravity flow design and the fact that it remains quiet throughout use. One client complained it was ruined after dishwasher use. The Lixit Faucet Waterer is an amazing invention that serves as a wonderful economic dog watering system. This unbreakable water dispenser is not only affordable for all users, but its ultra-convenient design allows users more flexibility in use because all you need is a working water base such as a hose. The Faucet Waterer easily attaches to any faucet in the outdoors or any outside water hose as well. It provides a source of clean and fresh water 24/7 on a consistent basis with no error. Just simply attach the steel nozzle to any water system and your dogs are good to go. Its compact size makes it ideal for travel and can be taken anywhere. It’s literally a tap for pets! And it shuts off automatically too. The Lixit Dog Faucet is a top pick for an ecological and clean water dispenser for dogs. Dogs love the simplicity of having an outdoor water reservoir that doesn’t require any device or product just simply lap up the water. 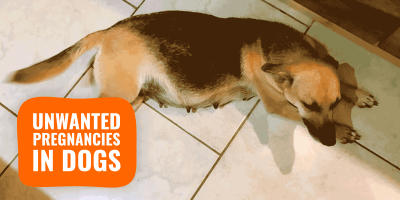 Some users use peanut butter in order to entice the dog to initiate contact.